You can help homeless people AND benefit the environment at the same time by collecting plastic grocery/store bags and making them into sleeping mats. The mat provides a soft place to lay their head and help keep plastic bags out of the oceans and landfills. 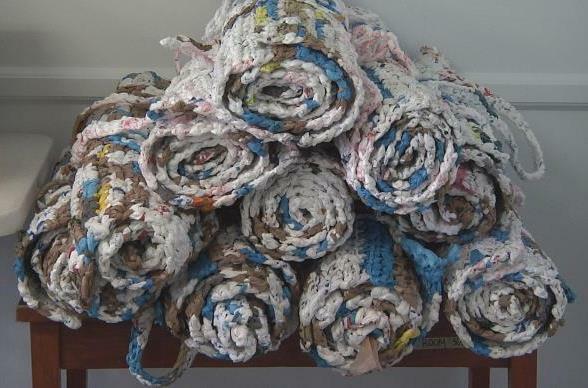 Each 6-foot by 3-foot mat is made with an estimated 700 recycled plastic grocery bags. They are lightweight, waterproof, keep bugs away and make ground sleeping a little more comfortable. BE A COLLECTOR: Collect clean plastic bags and put them in the collection box in the lobby of River Springs Church. BE A FOLDER: Return the bags to their original, flat shape. BE A CUTTER: Cut off the bags’ handles, as well as an inch from the bottom of the bags. Then cut the bags into 2” loops. BE A PLARN MAKER: Link the loops to form PLARN (plastic yarn) and roll them into balls like a ball of yarn. CROCHET OR WEAVE: Crochet or use a loom to weave the PLARN into a 6’ x 3’ mat. Contact missions@riversprings.org for more details!